Campaign for the American Reader: Pg. 99: Stephen Hinshaw's "Another Kind of Madness"
Pg. 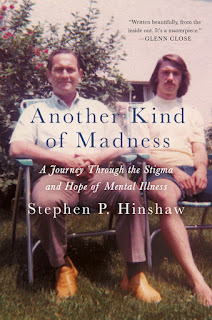 99: Stephen Hinshaw's "Another Kind of Madness"
Featured at the Page 99 Test: Another Kind of Madness: A Journey Through the Stigma and Hope of Mental Illness by Stephen Hinshaw. The Page 99 Test: Another Kind of Madness. What is Carlie Sorosiak reading? What is Barry Lancet reading? Pg. 69: Patrick Dacey's "The Outer Cape"
What is Jeannine Atkins reading? Pg. 99: David E. James's "Rock ‘N’ Film"
Pg. 69: Mary Kubica's "Every Last Lie"
Pg. 99: Alice Weinreb's "Modern Hungers"
What is Mary Kubica reading? Pg. 99: Tristan Donovan's "It's All a Game"
Pg. 69: Keely Hutton's "Soldier Boy"
What is Elizabeth Anderson reading? Pg. 69: Laura Levine's "Death of a Bachelorette"
Pg. 99: Samuel C. Heilman's "Who Will Lead Us?" What is Cynthia Eden reading? Pg. 99: Jean R. Freedman's "Peggy Seeger"
Pg. 69: William C. Dietz's "Seek and Destroy"
What is Tristan Donovan reading? Pg. 99: Howard Jones's "My Lai"
Pg. 99: Jack Ewing's "Faster, Higher, Farther"
What is Gail Godwin reading? Pg. 99: Llana Barber's "Latino City"
Pg. 69: Marina J. Lostetter's "Noumenon"
Twelve books for fans of "The Handmaid's Tale"
Pg. 99: J.M. Opal's "Avenging the People"
Pg. 69: Gail Godwin's "Grief Cottage"
What is April Henry reading? What is Sarah Creech reading? Pg. 69: Cynthia Riggs's "Trumpet of Death"
Pg. 99: Gregory P. Magarian's "Managed Speech"
Pg. 69: Sarah Creech's "The Whole Way Home"
What is Alison Taylor reading? Eight books for fans of Stephen King's "Misery"
Pg. 69: Alan Drew's "Shadow Man"
What is Alan Drew reading? Pg. 69: Kate Quinn's "The Alice Network"
What is Mark Powell reading? Pg. 69: Heather Gudenkauf's "Not A Sound"
Pg. 99: Paul Shaw's "Revival Type"
What is Greg Garrett reading? Pg. 69: Courtney Maum's "Touch"
Ten top books for fans of CBS's "The Good Fight"
Pg. 69: Wendy Webb's "The End of Temperance Dare"
What is Heather Gudenkauf reading?